We offer our specialist measure and install of glass splashbacks and panels throughout the whole of the south of the UK and London areas. Our expert surveyors will visit your property and make detailed plans of your wall space, noting any irregularities as well as the holes and notches necessary. This is the safest way to ensure a seamless fit and the highest quality positioning and fixing of your glass, particularly if you require any socket cut-outs or shaping. Our employees are extremely experienced and work to tolerances of just +/-1mm, providing a perfect fit and a quick, smooth installation. We provide you with an estimate based on your own rough measurements. If you are happy to go ahead, we will request a deposit of £200; once this is paid we can be with you within the week to carry out the survey. If you are having a new kitchen installed, however, we will wait until the units, worktops, electrics and any fixtures and fittings have been put in place before our visit. We will then confirm the final price – this will go up or down depending on the accuracy of your initial measurements! – and will request the next amount due which takes it up to 50 per cent of the total cost paid. Your glass will go straight into production and we will return to fit it within just 8 to 10 working days. The final 50 per cent is only due when your glass is installed and looking stunning! 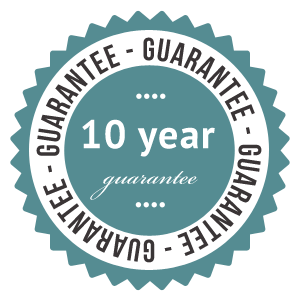 We guarantee our installation for 10 years.